About a week and a half ago we made the strangest impulse purchase ever. Jamie calls me from work. I answer. Jamie: Hey Gary’s friend is moving and wants to sell his chickens. Do you want them? Me: Uh, I don’t know. Um, how many? Uhh, we don’t have a chicken coop. Are chickens hard to take care of? I don’t know. I was thinking next spring. Like, not right now. Jamie: Ten. We’ll figure something out. We have to get them before Monday. So, do you want them? 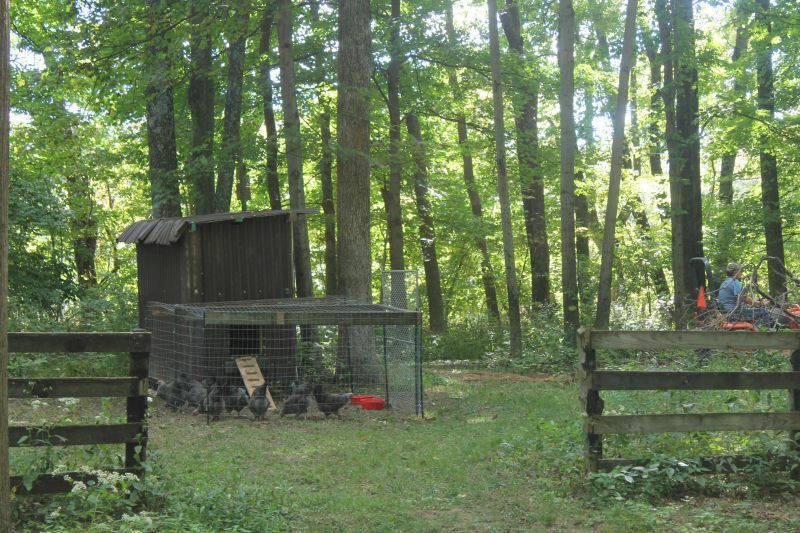 I hung up the phone, did some research on chicken coops, and then realized my “sure” might not have been the best idea. 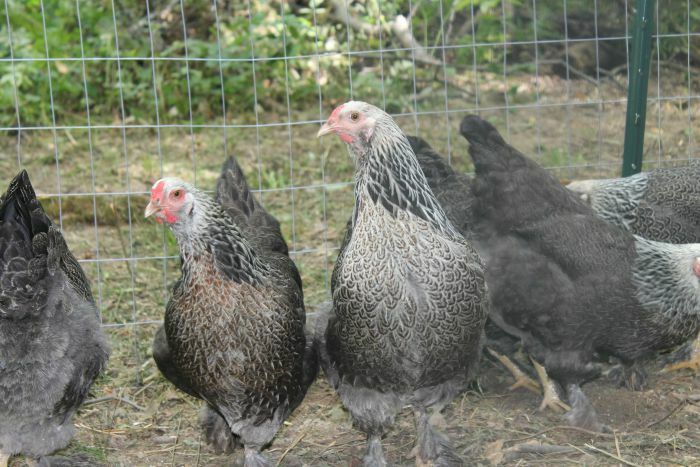 New chicken coops of the size we needed were ranging from $400 – $2,000, not including fence. Oops. I called a family member who raises chickens to get his opinion. He told me to build one and wanted to buy the chickens for himself if we didn’t end up wanting them. The next day Jamie was at his job site and noticed a chicken coop that was going to be for sale at an upcoming auction. He took off work early to attend. Not only that, but he also purchased a like-new dog kennel for $65. It just so happens that the guy with the chickens needed a dog kennel and we already have too many. Instead of paying $8 per chicken for a grand total of $80 we traded the $65 dog kennel for the 10 chickens. We then had to purchase $100 worth of fencing materials. The other stuff we needed like a place for them to nest and roost was easily built out of existing material. Plus we already had a surplus of straw and various animal bedding on hand. These are laying hens. 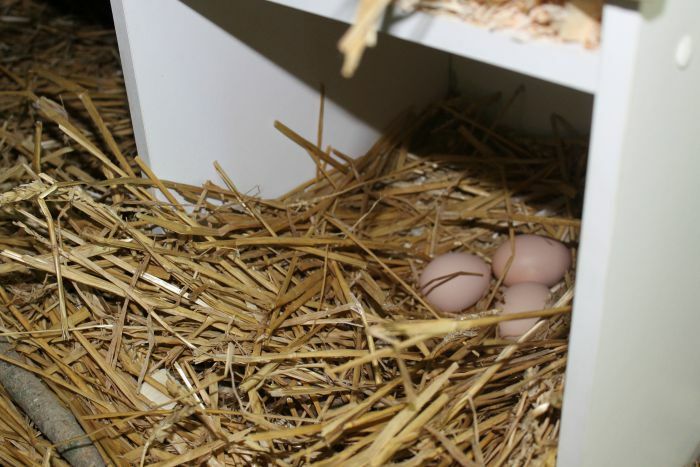 They’re only six months old and in the past week have been producing around 6-7 eggs per day. Since eggs very conservatively cost at least $2 per dozen, and since we go through a ton of eggs, we’d only need to get 111 dozen eggs to completely recoup the initial investment. From my calculations we’ll break even in about seven months by using what we need and then selling the surplus at $2/dozen. (If they start laying 10/day we’ll break even almost twice as fast.) The feed is pretty inexpensive (plus we’re letting them run around and forage) so even after taking that into consideration it doesn’t take long for them to become a money saver or even a money maker! And you know what? These chickens have been easy. So much easier than dogs. Give the chickens a nice place to roost and lay eggs, feed and water them, let them run around a bit, lock them up at night, and collect eggs. I’m completely loving them so far. And so are the girls. I think this is like Easter egg hunting for them every day. They can’t wait to see how many eggs the chickens have laid as soon as they get home from school. We now have one set of animals that is actually saving us money rather than costing us. Best impulse purchase ever. Glad you like your eggs. I buy from a local farmer, I don’t believe in factory farming any animal OR debeaking chickens. Yeah those thoughts make me cringe. I’ve been now been thinking of raising my own meat. I know it’s better for the animals than what you buy out of stores but I just can’t get past the whole raising and then killing an animal. I think the eggs are one step in that direction though! Good job! Don’t forget… those are free-range eggs. Your chickens are a heck of a lot healthier and happier than chickens that produce regular eggs for Wal-Mart. Where I live in Philly, eggs like that don’t sell for any cheaper than $5/ dozen. Thank you! Wow $5/dozen would be pretty awesome. I think my $2 was fairly conservative and if I were to sell them I could probably get $3 here. This is one of my goals to have a chicken coop. Sadly where I live at I can’t have them. I tell you what this was fate! I love the cost and how much money it will save you and make you. Good call, girl! I want chickens but I travel too much and I don’t have a backyard. But, if I did-I would get some. Definitely understand about the travel. If you ever do get some they’re pretty easy to take care of. (Or have been so far anyway) I don’t know what I was so worried about. I saw some ads on Craigs List last year for chicken coops and was shocked at how expensive they are. I tried to talk my boys in to the idea that we should be in the chicken coop / palace business but it was a No Go. Did it cross your mind that you bought a trailer to live in for 6k and that you can spend 2k on the chickens ????? You composting the waste and soiled straw ? I don’t think I’d ever spend $2k on the chickens unless there were about 100 of them! I think the chicken coop building could be an awesome side hustle. The $2k chicken coops I saw were from a local business in town and were hand built. The cheaper ones were just TSC models. I have neighbors who just got some eggs and she gives us eggs in exchange for all the produce and news papers that I give her for her compost bin. It’s a good exchange. I’d love to have some myself but we don’t have a fence and I love my neighbors behind us too much to divide us with one. Here in Iowa the flu is affecting much of the fowl population, even the the free-range that many of my neighbors keep. The price per dozen is up to nearly $3. Great investment! How fun!!! We wanted chickens when we first moved here! Sounds like a pet I can handle! I’m afraid my kids are going to want guinea pigs or hamsters like I did when I was little and I don’t like those animals anymore. They’re smelly and kind of freak me out. I’m all about pets that can give you food and that can stay outdoors, though!! Good luck, can’t wait to read more! Yes, it has been awesome to walk outside and grab eggs when I need them. It’s kind of addicting. Makes me want to look more into self-sufficiency type of things.